Then and Now "Then and Now" is a series of articles written by local historian Margaret Landis for the Kansan newspaper. The series commemorated the 100th birthday of Kansas City, Kansas in 1986. Kansas City, MO Public Library This site has old photographs from the Wyandotte County area and more. All but the last photo were taken in the same area. The last one was taken closer to Hurrelbrink Rd. A couple of online maps say the little lake is called Bennets Lake. This may have been the spot of a pool a long time ago. My Father remembers a small lake being right next to a public pool. I have yet to find anything online. Click on this link to view a couple of aerial photos of the area. 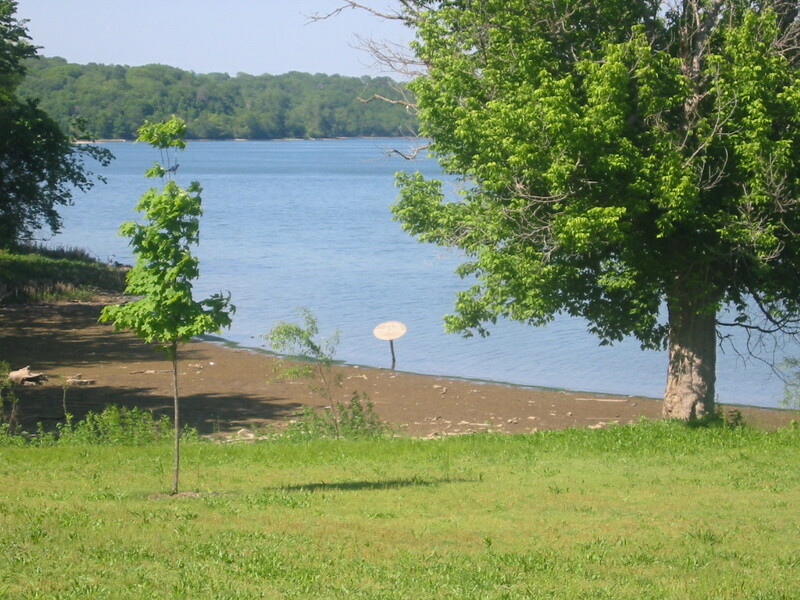 Bennet Lake sits on a hill above and to the West of the 91st entrance to Wyandotte County Lake Park. Another hill above the lake is where the Woodlands Dog & Horse Track currently resides. This used to be the site of Lakeside Speedway. North of Bennet Lake was the Bennet Swim Club pool and a Ballroom. Below the lake, closer to 91st Street, is the Bennet Home. 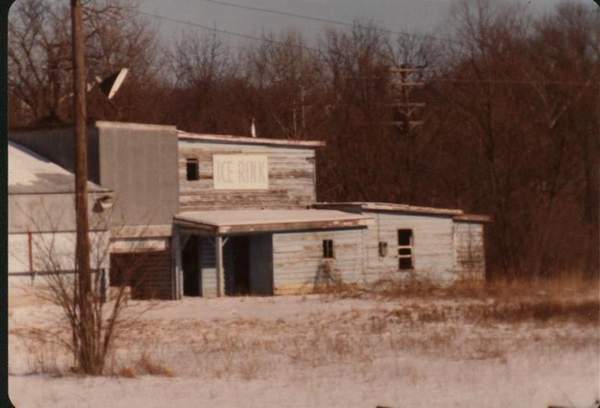 This is also the area that had the drive-in, amusement park and ice rink. Read below to learn a little more and to find out how I learned this. The following photos are from the private collection of D. Haworth. They are used with his permission. This is the Bennet House. Bennet was a developer and the lake above is named after him. This house sits along 91st Street below the lake. It is still there today. 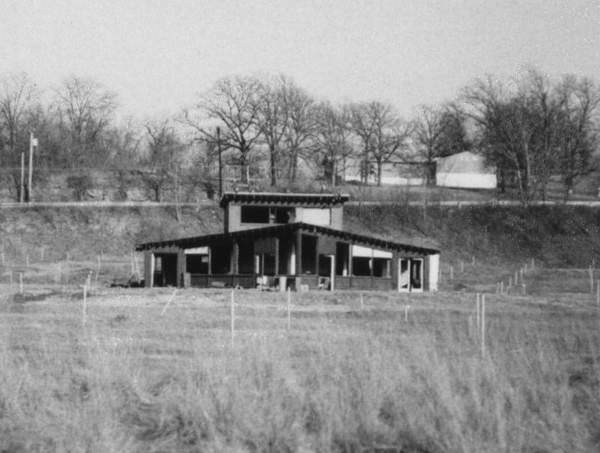 This is the old drive-in at the corner of 91st and Leavenworth Road. It is no longer there. The building you see in the background is the old VFW Hall which is currently a daycare center. This photo is looking East. This is an ice rink that also used to be at 91st and Leavenworth Road. Mr. Haworth tells me that the ice rink was behind (South) the Bennet home. I believe the building is gone now as I have not seen it myself. Mr. Haworth has told me that there was a ballroom next to the Bennet Swim Club that sat above and next to Bennet Lake. Information from Mr. Mike Connor, the Director of the Parks Department. There was the Drive-in, swimming pool, lake, nightclub, chicken dinner hall, ice rink, kiddie playland, golf course, race track all located in the general area. The following information comes from conversations I've had with Mr. Mike Connor, the Unified Government director of the Parks Department. "The object in the picture is the remains of a Canada Goose nesting site. The bottom of a blue plastic barrel was attached to the plate sticking out of the water and filled with hay. There were 8 to 10 of these placed in the lake at various locations in the mid 1980's to encourage the nesting of the Canada Goose. At that time they were thought to be close to being placed on the endangered list. Boy was that a mistake, now we are trying to get rid of them." Urban Legend of Wyandotte County Lake, the sunken construction equipment! The rumor is that when the Lake was being built a storm caused the Lake to fill up more quickly than originally planned. One of the machines used in the construction was evidently left at the bottom of the lake as a result.